How Will Brexit Or Non-Brexit Affect The Property Market In Singapore? The Brexit referendum held in 2016 was a turning point in the history of the UK. On 23 June of that year, 51.9% of the country’s voters opted to leave the EU. The legal framework and the rules regarding the withdrawal provided almost three years to the UK to make the transition. However, although the original deadline to leave is over, the process of disengagement is far from complete. Recent developments indicate that the chances of an orderly exit from the EU seem remote. UK’s politicians can’t seem to agree on the steps to be followed to leave the European Union. As events unfold over the coming months, a clearer picture of Brexit will emerge. What will be the terms of the final exit? Could there be another referendum? Will the Labour party come to power? Whatever the answers to these questions, one thing is certain. The status quo has changed forever, and the relationship between the UK and the EU will never be the same again. The changes brought about by the Brexit referendum will be far-reaching. Global trade, the world’s financial markets, and many other areas will feel the impact. In fact, the issue of Brexit is even likely to affect a seemingly unrelated sector such as the property market in Singapore. Why should Brexit influence real estate values in Singapore? It could be hard to imagine that developments in London would have an impact on property prices 7,000 miles away in Singapore. But this is a real possibility. Let’s understand how this could happen. Bear in mind that the London property market attracts high-net-worth individuals (HNIs) from across the world. According to the British Property Federation publication Who Buys New Homes In London And Why?, 49% of Prime Central London properties are bought by overseas buyers. But the prospect of Brexit has dampened demand from this segment. What about the prices of UK real estate? The news isn’t very good. On a year-on-year basis, house prices increased by 0.1% in January 2019, the slowest in six years. The rise in February was only 0.4%. A survey conducted by the Royal Institution of Chartered Surveyors found that its members expect house prices to remain flat or to decline this year. The reason? Uncertainties about Brexit. Falling prices coupled with a reduction in the number of sales transactions is a clear indication that foreign buyers are moving away. Or, at best, they are adopting a “wait and watch” attitude. 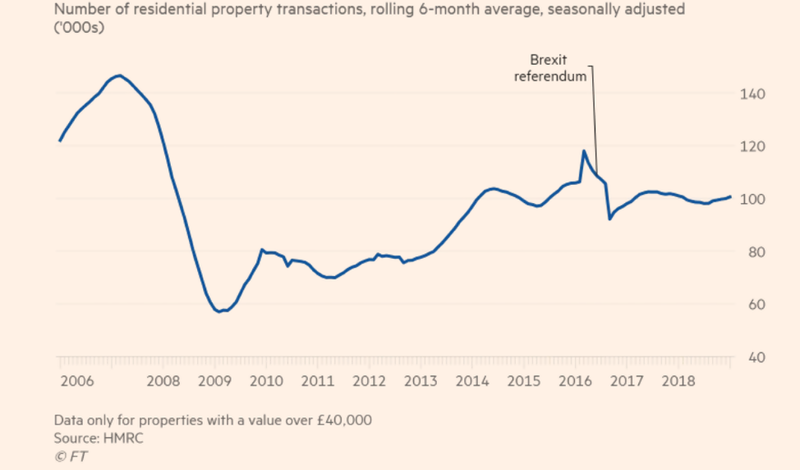 The prospect of Brexit seems to have had a negative impact on London’s property market being viewed as a safe haven investment by foreign buyers. ⇨ A stable economy with a record of steady growth – in 2018, Singapore’s GDP expanded by 3.2%. The Ministry of Trade and Industry (MTI), the government body that provides direction to the country’s economy, estimates growth will be between 1.5% and 3.5% in 2019. ⇨ Strong governance and the rule of law – Singapore is one of the most well-run countries in the world. Property rights are strongly upheld, and foreign investors can be confident that their interests will be protected. ⇨ World-class infrastructure – the country has an efficient Mass Rapid Transit (MRT) system and excellent roads. The country ranks in the top ten for the fastest internet speeds globally. ⇨ Demand for real estate – Singapore’s job market offers many opportunities for overseas professionals. The steady influx of expats into the country create an ongoing need for new residential units. Many foreigners rent private residences. Some even choose to purchase a home in the country. Consequently, there is a strong rental market as well as demand for new properties. It’s important to remember that Singapore’s property market has been a favourite with foreign buyers for many years. The change in the relationship of the UK with the EU could result in HNIs who want to buy real estate in another country choosing Singapore over London. Coincidentally, the current property values in Singapore offer an excellent buying opportunity. Conditions in the real estate market in Singapore are just right for overseas buyers. Prices are down, and a purchase made at current valuations offers the likelihood of gains. The chart reproduced above shows that the prices of private residential properties in Singapore have remained relatively flat for the last three quarters of 2018. How did the Index perform in the first quarter of 2019? It declined by another 0.9 points, falling from a level of 149.6 in 4Q18 to 148.7 in 1Q19. That’s a drop of 0.6% in a single quarter. Luxury home prices decreased by an even higher percentage. The Urban Redevelopment Authority reports that prices of non-landed private residential properties in the Core Central Region (CCR), fell by 2.9% in 1Q19. What does this mean for international buyers who are considering a real estate purchase in Singapore? Considering the state of the property market, it could be a good time to buy. The Brexit negotiations that are currently in progress between the UK and the EU could have several outcomes. A “no-deal” Brexit or a “hard” Brexit is a real possibility. However, regardless of the result, the damage seems to have already been done. The London property market has been negatively impacted by Brexit. There is a chance that the outlook for real estate in the UK may deteriorate further. Singapore is well-positioned to take advantage of this development. The immediate future may see more international buyers viewing real estate investments in Singapore as an attractive option.